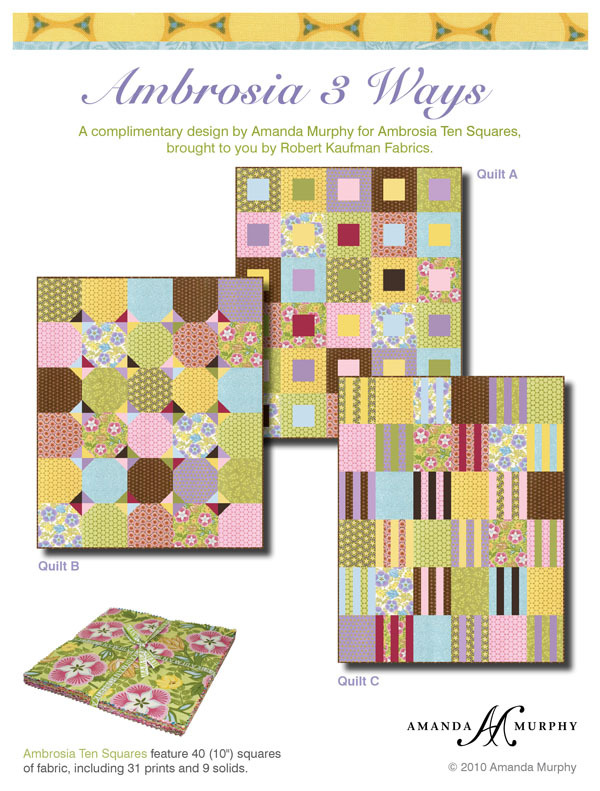 Robert Kaufman, in conjunction with Julie Herman of Jaybird Quilts, is sponsoring an Ambrosia Ten-Square Giveaway! I’ve designed three quilts that can be made with Ambrosia Ten-Squares and included them in my complimentary Ambrosia 3-Ways pattern. To enter, leave a comment on this blog telling me which of the three designs you prefer. Then head over the the Switch and Swatch and do the same. You must enter a comment on both blogs to be eligible to win. Oh, I'm First, Yippee Skippee!! I love Quilt A. I am a huge fan of squares in squares. Simple and Clean!! It's hard to pick between A and B, but I'll go with B because I've been wanting to try that block for a while. It is hard to pick between A and C, they are both beautiful! I think I will go with A! Thanks! I love the stripey one! I love C – all those stripes! I am LOING quilt A! Thanks for the chance to win! I like A and B. I think I would go with B since I have never done anything like it before. Hey do I get extra points for entering while 34000 feet above Ohio flying home. LOL I love gogo wifi with wings! I get to keep up with all the fun that way. I really love quilt C but all 3 are very kewl in their own right. I love quilt c's layout. The colors in your collection are lovely! I love them all, but Quilt A is my favorite! Since I HAVE to pick only one, I guess it would have to be Quilt 1. 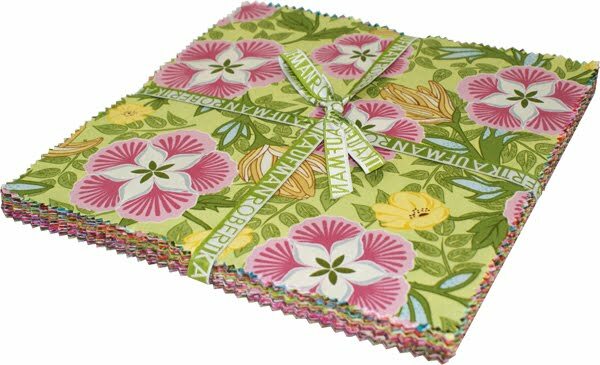 I love quilt A. Gorgeous fabric! Quilt B is the best I want it! What lovely fabrics in this collection. Thx for the giveaway. I like quilt A, the square in a square. I would like to make the quilt C one first. I offers blocks to showcase the larger prints and adds more interest with the pieced squares. Very pretty line! Quilt A though Quilt B runs a close second. I love B but think I'd have to make A too! Thanks for the giveaway! I love quilt A – and those fabrics – wonderful colors! Love the colors, it's hard to choose but if I had to I would choose the Summer colorway as pink/green is one of my favorite color combinations. Quilt A. Definitely quilt A. Gorgeous! I like Quilt A. Quilt C is extremely close behind. Option A is my favorite today. Quilt A is a favorite. I think the simplicity makes the colors and fabrics pop. They are all great but I'm leaning toward Quilt C! i like A a lot but also C. Thanks for the chance. I'm picking A as my favorite but I like all 3. Thanks for the chance to win. definitely the top one~square in a square 🙂 thanks for letting me enter. All very sweet but I prefer Quilt A. Thanks. I think I like Quilt A best – square in a square! They are all pretty but I think A is my favorite! Thanks for the giveaway-Ambrosia is beautiful!!! Quilt B for sure. Love the snowballs. Much prettier than the real snowballs we'll have outside soon. Love the Ambrosia fabric – gorgeous! Fav pattern is the block in a block. It is so versatile! I really like Quilt C…all three patterns are lovely though! Oooh how can you make us pick 1. I love them all…..ok I pick A. Thank you for sharing. It brings out the beauty of each fabric stamp. They're all awesome, but I'd have to go with C! I think I would go with B. Love the fabrics, thanks for sharing! I do like them all, but quilt A is my favorite. My favorite is quilt B. Thanks for a very generous giveaway. I LIKE 'A' QUILT BEST; HOWEVER THEY ARE ALL GREAT! THANKS FOR SHARING! and thank you for the lovely giveaway.. I usually go for blocks within blocks but prefer quilt C in this group. I love quilt b. Squares are my favorite. I really like quilt A the best and love the fabrics. Beautiful. I like quilt A the best, and I love the fabric. I like Quilt A; reminds me of playing board games. I love the square-in-a-square pattern of A. The fabrics are so beautiful! I would love a chance to usw them. Quilt B is very cute! I always love triangles. Thanks for the giveaway! I really like Quilt C. I like the solid blocks mixed in with the strips. It is a really dynamic and fresh look. Love Ambrosia! Can't wait to try it. Hope I win! Thanks for the chance. I love quilt A. Thanks for the great giveaway!! What a great giveaway. Your fabric is beautiful and I wish you all the best!